Keystrokes Lite uses a new approach to typing on the iPad. Each keypad responds to swipes to access many characters. 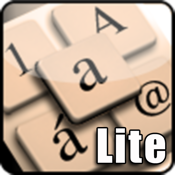 The Lite version allows you to store one Note at a time, enlarging or reducing the keyboard, or using a right- or left-hand layout. Access many characters not currently available on the iPad default keyboard. THANKS to Apple for featuring Keystrokes Lite under NEW & NOTEWORTHY Productivity apps! In response to many requests, the paid (regular) version of Keystrokes will have a swipe-capable QWERTY horizontal keyboard, in addition to several other keyboard layouts, and the ability to store multiple notes. Keystrokes Pro will allow users to create their own keyboard layouts, defining characters for each keypad, in addition to many other features. For more info, visit www.scriptingevents.com. And thanks for all the feedback!